Comics Should Be Good: Let's Dispense Advice!! And I mean this in the nicest way. I just thought it would be cool to look at the major comic companies (who that means to you is up to you), and find an area where you think a slight change would make a big improvement in one (or more) books from the company. The only rule....you can't call for someone to be fired (or "have Jeph Loeb write just like Grant Morrison")...but you CAN ask for creative teams to be switched on to books that are more appropriate for them (in your opinion, natch). My first piece of advice is to have Marvel let Roberto Aguirre-Sacasa write more "one and done" stories. I like his writing, but he does not yet seem to have nailed the whole "sequential" part of "sequential art." His first storyline on Marvel Knights 4 seemed to repeat itself every other issue. Each one was GOOD, but very repetitive. Therefore, I would let him write a "storyline" of one-shot stories, and ease him into the sequential stuff later. This goes to both Marvel and DC. 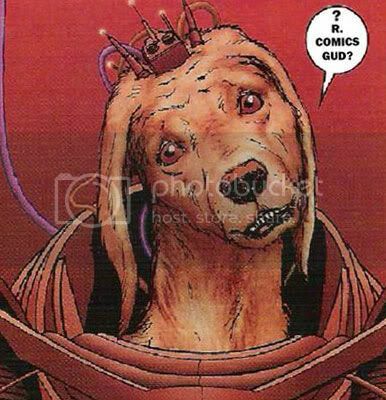 Hire Grant Morrison to write everything. Clone him a few times if this proves too dificult for one Morrison to do... though I suspect that Grant has the power to clone himself somehow. If you hire Morrison to write everything, then you would have to fire people!!! HowEVER, a nifty way around that is an idea I've had before, which is just to have Morrison plot out every title. That way, he can influence the direction of every book, but not fire the other writers. Of course the last time that Morrison plotted out all of the DCU titles, we got that DC 1 Million supermegacrossover. My advice would be "stop it". And "it" is whatever they happen to be thinking of at the moment. Marvel- Stop flooding the market with new X-Books. No one line can support 18 titles. Slow it down a bit. Marvel and DC should stop doing depressive stuff like Identity Crisis and Avengers Disassembled. It's just dull. Mature stories doesn't have to be depressive (Sandman, Human target and Invisibles are cool examples of mature done right). And super-heroes doesn't have to be "mature". I'll second the "Grant Morrison plotting all titles" option. I thought people LIKED DC One Million? Lord knows it was the only crossover that I actually really liked. The core stuff (IE, what got printed in the trade) was cool, but a lot of it bordered on pointless. Hmmm...okay, I'll give you that, but I would argue that the really pointless stuff were by the writers who clearly were NOT taking direction from Morrison (guys like Dixon and PAD). "In the case of Superman #1,000,000, I wrote a plot and it was a good story...it didn't contradict anything they had to say. They read it, bounced it, trashed and I quit. That's why that issue of Superman was written by someone else. They didn't want a writer, they wanted a trained chimp...It was the worst experiences I've ever had in this medium, and it's largely because of Grant trying to write everybody's book. If that's the way they wanted it they should have told everybody to take the month off. I know a number of writers who wroked on the 'One Million' books and were quite put out by it." "It (DC: One Million) was one of those things that came out of a conversation with Mark [Millar}...basically I plotted everything that month, every single comic except Hitman. With that I just said, 'Garth, take the piss', that was my plot. The rest of it was quite detailed...I plotted sixty-four comics that month and wrote five of them. It was big. That took a few months." Oh, I wasn't saying that I didn't like DC: One Million, it's like what someone said above, the stuff in the trade was great--the rest was just bunk. Omigod...Morrison wrote the Supergirl story in Supergirl One Million? Some writers can turn a good or decent plot into horrible crap. Morrison could have personally handed some DC writers an outline for the story and they'd still manage to botch it. New on for DC- Market the new Legion of Superheroes book excessively to teens. This is exactly the kind of thing the little bastards will eat with a big kryptonite spoon. I got the 4 trade for Christmas. It didn't seem that repetitive to me. My critical judgement could have been impared a bit, though, due to my massive head cold. As far as my advice, I'd definitely go with less X-Books. At the rate they're pumping them out, Paul O'Brian will be dead by next year. I'd also encourage both DC and Marvel to experiment with formats. It's pretty obvious the monthly comic isn't a good money to content value, so pushing something like those Marvel Age reprints they have at Target isn't a bad idea. And everytime I go to Target, the Marvel Age books seem to be well loved--whether or not that translates to people actually purchasing them is another story. With a gift card for Borders I bought the first two (only?) volumes of both the Superman and Batman Adventures Digests. I finished the first Superman story and thought, "Geez, that was a pretty good read. A Superman story that didn't need to be a 12-issue arc involving a who's who of Superman villains." I would expand further upon the request of having a storyarc of single issues--let's make it a blanket policy for a while, kinda like the policy Denny O'Neil had after a number of supermegacrossovers one after and another in the Bat-titles.